In this episode, the group argues about the best course of action and discovers that while the kids are incredibly well-equipped for the environment, the Digimon are not. In many shows, episode two is almost as important as episode one in establishing the setting and the general plot concept. For example, it's the most important episode of Pokémon: it's the one where Pikachu impresses Team Rocket enough for them to want to pursue him for the next several years. If episode one ends on a cliffhanger, episode two better set everybody on the proper course. Thankfully, this does. Since I knew this and the next several episodes feature one of the Digimon evolving to Champion in turn, I was planning to cover less of the episode and focus more on initial thoughts on the character in question. This was supposed to be Tai's episode, but it's really not. If it's about anybody it would be Joe, but the more interesting thing seen here is our first glimpse at the group dynamic. After Gomamon provides for their narrow escape and we get a quick round of name-drilling for all the Rookie levels and a primer on evolution, it becomes clear that the honeymoon is already over and the kids want nothing more than to get the hell out of this place. They've been there half an hour and they're already stressed out. This makes for much better TV as there's no unbreakable bond with the Digimon or each other yet. There's no common purpose uniting them against all odds. It's just a few kids trying to get their bearings long enough to find a way home and each of them wants to go about it differently. There's some dissension, arguing, freaking out... good times. Best of all, Tai hasn't earned the leader position yet so this beast is walking around with no head. Everybody follows Tai not because they agree with him, but because they either want to stick together or are sick of Joe's complaining. As for Joe, he really ends up with a sad fate in this episode. Everybody remembers his complaining, his stubbornness and his neurotic insistence on trying to connect through payphones clearly planted as a practical joke. It's easy to get a bad first impression of him early on. Here's the thing: this episode also illustrates just how important Joe is to the team. 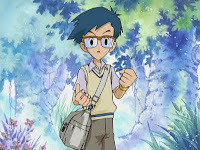 His Digimon saves everybody from falling into a rushing river. When everybody takes inventory (a decidedly Joe-like move), turns out he brought the essential food rations. 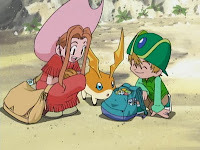 And if the Digimon had been half as prepared as he was, they might have hunted and foraged a little food of their own in advance rather than go hungry and let Shellmon kick their asses. 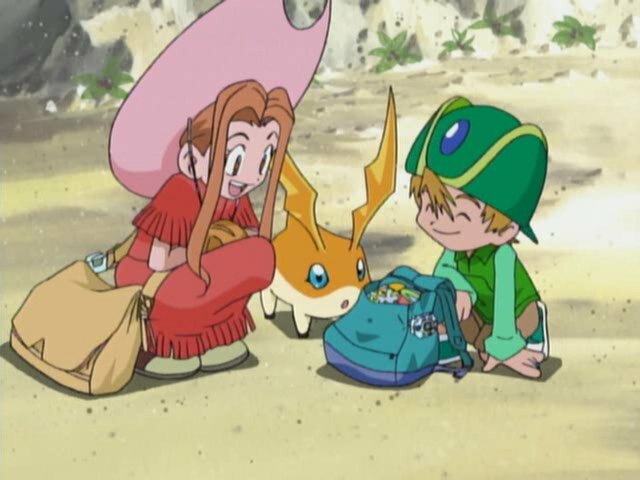 On that note, how in the hell are the transplanted children more prepared for wilderness survival than the Digimon?! I am very impressed that TK has snacks, Joe has full rations and Mimi has a ton of useful camping gear in tow. The Digimon fail by comparison. Moments after they claim to take care of their own nutritional needs and don't need rations, they are immediately rendered ineffective in battle because they're hungry. Agumon saves the day only because he and Tai stole some of the rations. He also evolves to Champion, but it's not like that won't happen again. This episode proves that Gomamon and Palmon are the most useful Rookies in the group, only because their attacks aren't generic projectile weapons. The dub catches a lot of flak for silly ad-libs at inappropriate moments, and deservedly so. It deserves credit though for silly ad-libs at appropriate moments like the phone booths because they're comedy gold. Everybody seems surprisingly dry and unharmed despite taking some pretty nasty shots from Shellmon. I can understand Joe's complaining. After all, the premise has some similarities to the Dungeons & Dragons cartoon, with Joe having the complaining qualities of Eric (but no where of a jerk as him). Luckily, he does get better. Also, I pretty much agree that Gomamon is one of better rookies in the group, dattebayo (don't you love seiyuu jokes). Joe's complaining is justified in the sense that he's taking the most realistic approach to the situation they're in. Other than him and Mimi, everybody seems to take the situation in stride. They react the way you would think people in real life would react being in a strange land that is foreign to them, not liking it and wanting out right away. (of course, this changes later in the series) Obviously, his suggestions for waiting for help and all his real world experience doesn't really come to fruition here and he's got to eventually face the fact that he's got to abandon all his real world knowledge and start doing things he's not accustomed. I feel like he combines both of these when he decides to climb Infinity mountain by himself, he knows that the situation is dire, a rescue team is not gonna help them and someone has to see if the mountain is safe for them to climb, the part where he abandons his rationalism is when he decides to climb on his own without anyone knowing, even proclaiming that he's very good at climbing. Its crazy to see Joe do this being portrayed as a coward and hypochondriac so far, but it shows that his willingness to let go of his rationalism and real world knowledge and do something that's not really his repetoire. (which he does a lot during this season) I agree with you that it shows how important he is to the group, being the voice of reason and his realistic views on situations. In later episodes, it shows how he grows from the complainer people proclaimed him to be. I like his role in the story but I just feel like he's underutilized sometimes. He could have been much more bigger character than what he was. Add in the fact he's always preaching safety, but is the first to push himself in danger for the sake of the others. He and Sora are essentially the "glue" to keeping the group together(or at least try to) and provide the "adultish" presence within the group. I agree that he was underutilized and so were many of the others in this series. Things start getting a bit more interesting in this one, when it's now clear that the kids are stuck on this File Island place with these strange digital monsters as their constant companions. 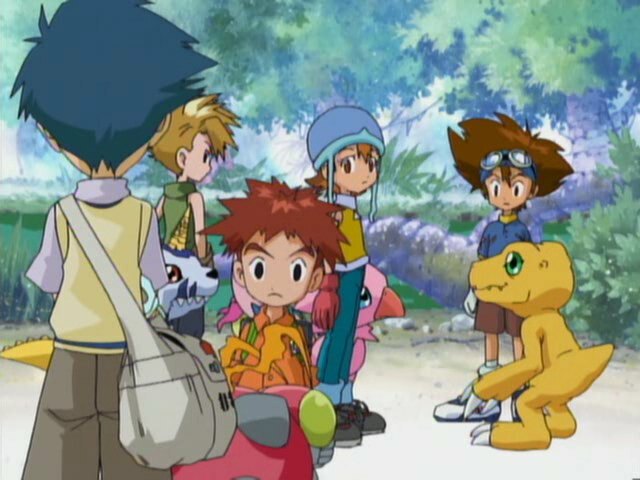 The real point of the episode seems to be to lay down the foundation for the group interactions - the kids with one another and with their Digimon. The battle with Greymon and Shellmon is sort of an afterthought, though it starts the formula of "the Digimon evolve to the Champion level when their kids are in danger" that we'll be seeing in all the coming episodes. Joe actually pretty quickly became my favorite Digidestined for all the reasons that got talked about. He's a respectful version of the Complainer Is Always Wrong archetype in that he's actually right about a lot of things and even the things he IS wrong about, his position is sensible and not entirely unfounded. Plus, he gets some of the best funny moments and lines!